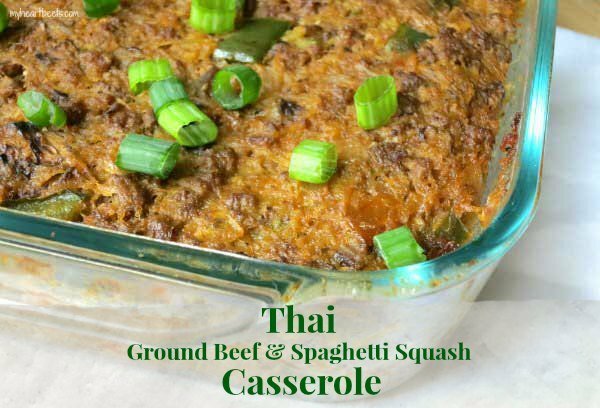 I love Thai food and I love casseroles, so it only makes sense that this Thai Ground Beef Spaghetti Squash Casserole exists in my world. 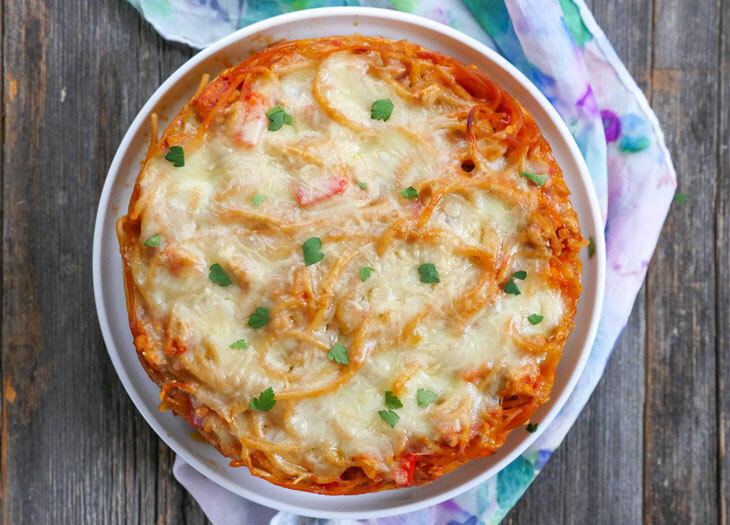 It’s delicious, comforting and it’ll have you looking forward to leftovers. I’m not kidding about that… it’s day three and as I write this, I’m thinking about what’s waiting for me come lunch. 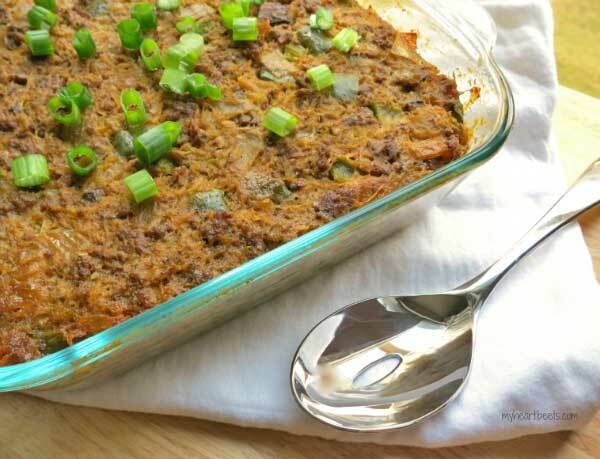 This dish has that sought after umami flavor, which enhances the taste of the entire casserole – ensuring that every bite will be as savory as the last. For those who aren’t familiar with umami – it’s a unique flavor that isn’t sweet, sour, salty, or bitter. It’s often described as savory. The mushrooms and fish sauce help to naturally add this flavor. I also use a handful of other ingredients in this casserole, including: spaghetti squash, organic mushrooms, coconut aminos, onions, ginger and Thai red curry paste. I love using spaghetti squash in my recipes (see this casserole and these breakfast bites for proof) because it’s such a bland fruit (yep, it’s a fruit). 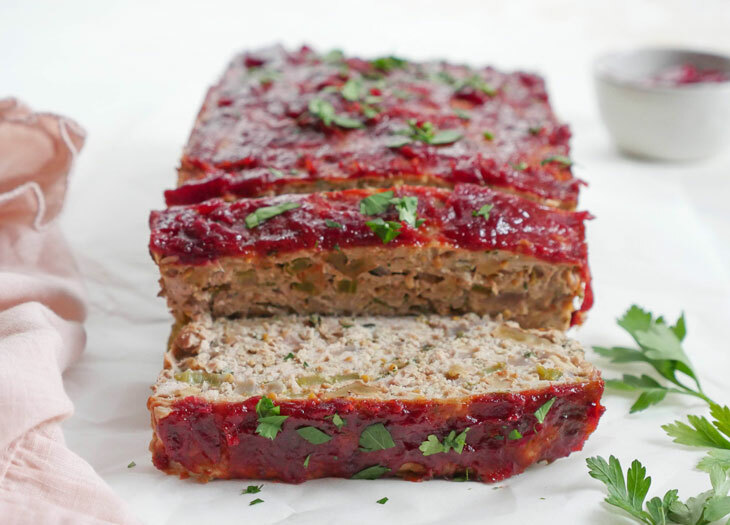 It’s a great way to add fiber to your meal and stretch one pound of ground meat to easily feed a family of six or in my case, a family of two…for like a week. Make this, love it and eat it often. Cut the squash in half, scoop out the seeds, and add a little oil, salt and pepper to cut sides. Place squash cut side down in a baking dish. Bake for 45 minutes or until you can easily pierce the skin with a knife (cooking time depends on size of squash). In a saute pan, add oil on medium heat and then add the onion, Thai bird chilies, and a pinch of salt. Once onions turn translucent, add the garlic and ginger. After a couples minutes add the curry paste, salt, and pepper. Mix well, then add the ground beef. Once the ground beef is almost brown, add fish sauce, coconut sugar and coconut aminos. Give it a good stir and then add chopped green pepper and mushrooms and continue to cook for about 5 minutes, stirring occasionally. When the beef is done, combine it with the cooked spaghetti squash strands and mix well. Add the whisked eggs to the mixture, then pour into a casserole dish. Bake casserole at 350 degrees for 30-40 minutes or until golden on top. This sounds amazing! 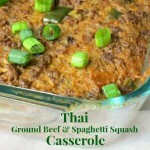 I love making spaghetti squash casseroles as well but never thought to do a Thai one. Printing to make – thanks! This was great! I’m curious — what do you do with the second tablespoon of oil? This was AMAZING!! Even my husband, who didn’t like vegetables at ALL just a few years ago is in love with this dish. 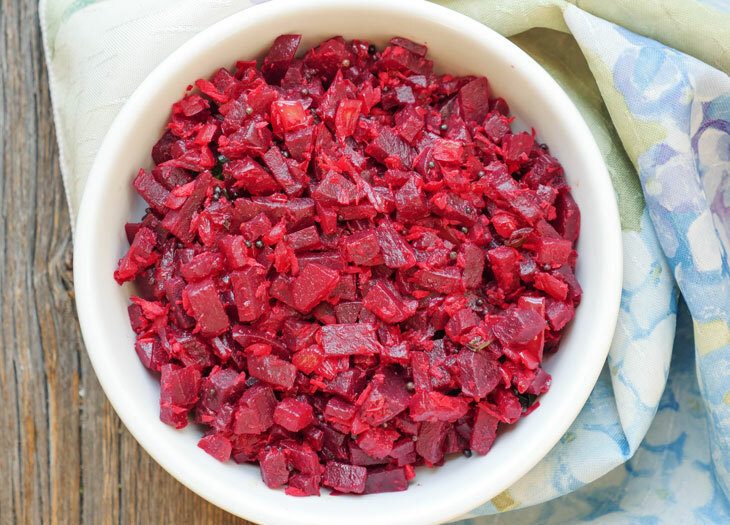 It has a lot of flavor, and once you’ve made it a few times, it’s a really short prep and you can throw it together really quickly. (if I cook everything while the spaghetti squash is baking, I can have it baking in 30 minutes) My husband actually asked me to make it again, which he has never done since beginning our junk-free diet. You did a fantastic, amazing job with this. Kudos and thank you, thank you, thank you! I just made this and it is fantastic! The flavors are incredible. New to your site – thanks for a great recipe. Looking forward to trying more! Jen, so glad you liked the recipe! And happy that you found my website 🙂 Hope you’ll let me know how any other recipes turn out for ya! Thanks, Lisa!! So happy you liked this Thai Casserole 🙂 And thanks for the sweet words, you made my night! Still my favourite “casserole” for three years running. 💕making it tonight! That makes me so happy to hear 🙂 Thank you!! This is FANTASTIC! It’s everything a great dish should be – a little spicy, warm and umami! Thank you!